JOS, NIGERIA (ANS) -- Gunmen believed to be members of the deadly Islamic extremist Boko Haram group yesterday (Tuesday, May 14, 2013) killed the Rev. Faye Pama Musa, secretary of the Borno state chapter of the Christian Association of Nigeria (CAN). He was 47. According to the Nigeria correspondent of Morning Star News ( http://morningstarnews.org ),the gunmen reportedly followed the long-time Christian leader from his church building, where he was holding an evening Bible study, to his house in the Government Reservation Area in Maiduguri, and shot him dead there, said the Rev. 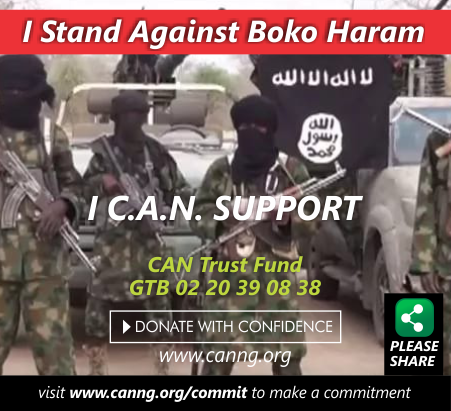 Titus Dama Pona, chairman of CAN's Borno chapter. "Rev. Faye Pama was killed last light," Pona said this morning by phone from Maiduguri, the state capital. "I am right now with his family, and they are still consulting on what next to do." Morning Star News went on to say that the assailants reportedly dragged the pastor from his home and shot him outside, in front of this daughter, who had followed them out pleading for his life. Pama was the father of three children. Senior pastor of a Pentecostal church, Rhema Assembly, Pama often spoke out against persecution of Christians in Borno state, epicenter of Boko Haram attacks in northeastern Nigeria. He had been involved in ministry leadership for more than 26 years. "The shooting happened within an hour of President Goodluck Jonathan declaring a state of emergency in Borno, Yobe and Adamawa states, allowing the government to send more troops and take other special measures to try curbing violence by Boko Haram," said the Morning Star Nigeria correspondent. "The group has reportedly killed more than 4,000 persons since 2009, and the state of emergency comes after a gun battle between the military and Boko Haram in Baga, Borno state last month that some say took more than 100 civilian lives. In a 2007 interview, Pama had said that he would not leave Borno state in spite of the danger to his ministry and life from Islamic extremists. "I am an indigene of Borno state, and God has called me to work among my people," he said. "I believe that the best people who reach a people with the gospel are those who understand the culture of these people." Pama believed that only by showing love to Muslims could they be won to Christ, "and not through fighting." An outspoken critic of the marginalization of and discrimination against Christians, Pama began preaching first with a Pentecostal ministry in Maiduguri, the Word of God Mission, in 1996, before he left to start Agape Ministries and planted Rhema Assembly, which has an associate pastor and about 200 members. He once served as secretary of Borno state's chapter of the Pentecostal Fellowship of Nigeria. "President Jonathan had also imposed a state of emergency in 2011 on 15 areas within four states in embattled northern Nigeria, with little success. Boko Haram, which the Borno governor says threatens to take control of the state, seeks to destabilize the federal government in an effort to impose strict sharia (Islamic law) throughout Nigeria," said the Morning Star News correspondent. "Boko Haram has attacked Christians particularly in Adamawa, Borno and Yobe states, destroying Christian-owned businesses as well as harming churches. Many Christians have fled as displaced persons or become refugees in Cameroon." Suspected members of the Islamic extremist group also attacked a police barracks on the outskirts of Bama Town, Borno state early on Sunday (May 12), according to Christian Solidarity Worldwide (www.csw.org). CSW reported that insurgents arrived shouting "Allahu Akbar [God is greater]" before launching explosives and fuel bombs, and the army dispersed them before lives were lost. The previous week, according to CSW, some 200 Islamic militants attacked Bama Town, killing 47 people.